This photo App helps you to edit multiple digital images at once. Even if you want to optimize several hundreds or thousands of photos, it’s easy with Photo GUN! Select your photos that you want to edit, Drag-and-Drop them into the App window. Now you can choose your desired operations, and leave the Rest to the Photo GUN! 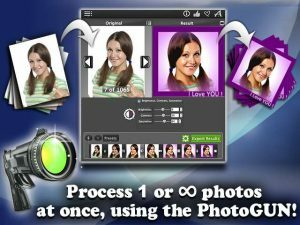 This App contains a number of operations that allow you to create creative photos. You can also convert your photos or customize their Format to suit your needs. If you want to rename your photo files, also no Problem! The order of operations can be changed by you at any time. If you want to use the same sequence of operations (operation flows) several times, you can save it as a Preset. And of course you can see the preview results after each Operation! Resize allows you to resize your digital images to suit your needs (Blog, E-Mail, social networks, your personal or business website). – Color Balance helps you adjust the brightness, contrast and color saturation of your images. – Vignetting is a creative effect, vignetting to emphasize the center of the image. This effect is often used in portraits. – Watermark allows you to add watermarks, your company logo or Text to prevent misuse of your digital images. – Crop allows you to crop unnecessary parts of your photos. – Rotate changes the angle of your images. – Mirror mirrors your digital images horizontally or vertically. – Blur blurs the unnecessary parts of your photos (you determine the level of blurring). – Borders allows you to add a photo frame. This Operation has a wide range of colors and frame Widths. – RGB Order changes the order of color Channels so that you can change the colors of different objects or groups of objects on your images. – Grayscale transforms color photos into Black-and-White images. – Histogram automatically improves all digital images made under similar circumstances. – Binarize turns your photos into monochrome images by adjusting their thresholds. – Invert allows you to invert the colors of a color image, and transforms your Black-and-White images in Negative.